MVNC implemented the NV200 and NV900 units in selected areas. 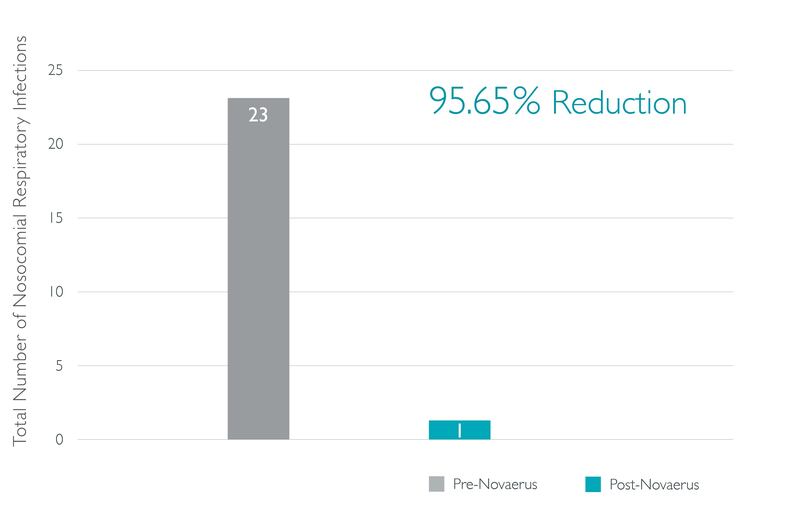 The periods selected for pre- and post-Novaerus review were August 2013 through April 2014 and August 2014 through April 2015. Comparison of like periods reduces the risk of skewed data related to seasonal variances. In the period after implementation of the NV200 and NV900 units in selected areas, the facility total number of nosocomial respiratory infections at MVNC decreased from 93 to 21, a 77.42% reduction. The total number of nosocomial respiratory infections on the first floor decreased from 39 to 14, a 64.10%. The total number of nosocomial respiratory infections on the second floor decreased from 31 to 6, an 80.65% reduction. The total number of nosocomial respiratory infections on the third floor decreased from 23 to 1, a 95.65% reduction.